in sharing new recipes found on fellow blogger's sites. Check out Tastepotting and Foodgawker for inspiration. 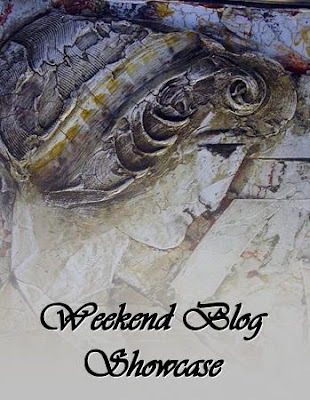 It is my turn to host the Weekend Blog Showcase and this week and I'm am thrilled with the recipe that I found on Jungle Frog Cooking. 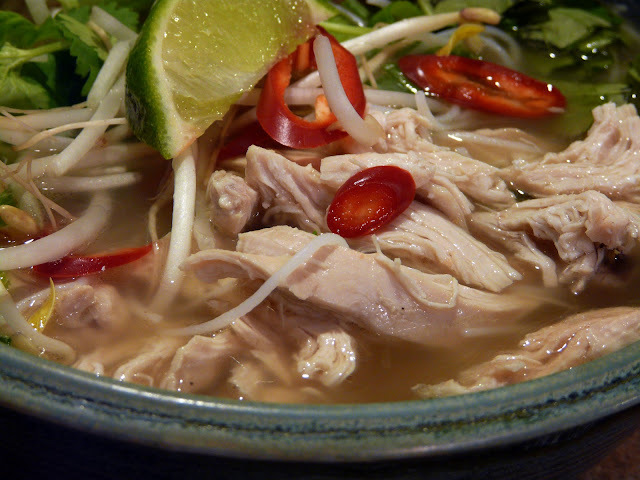 I love Vietnamese Pho and Simone's recipe for Chicken Pho was perfect. 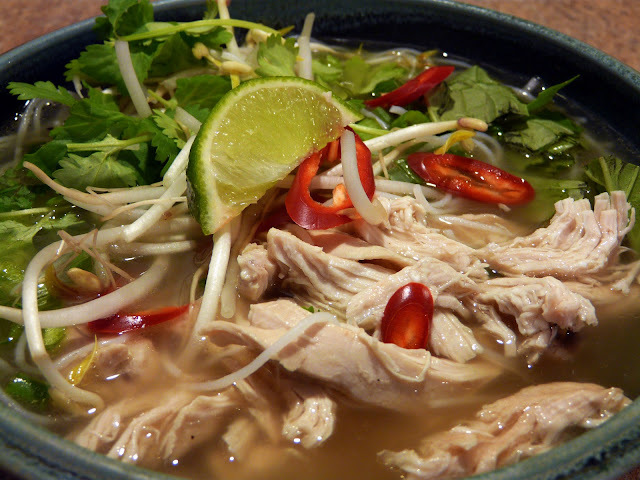 I wanted soup to take to lunch and I had almost everything I needed to make the Pho. I put a pot of homemade chicken broth on to simmer with a couple of chicken breasts and fresh ginger, garlic, and a cinnamon stick. I'm not a fan of star anise so I left it out. 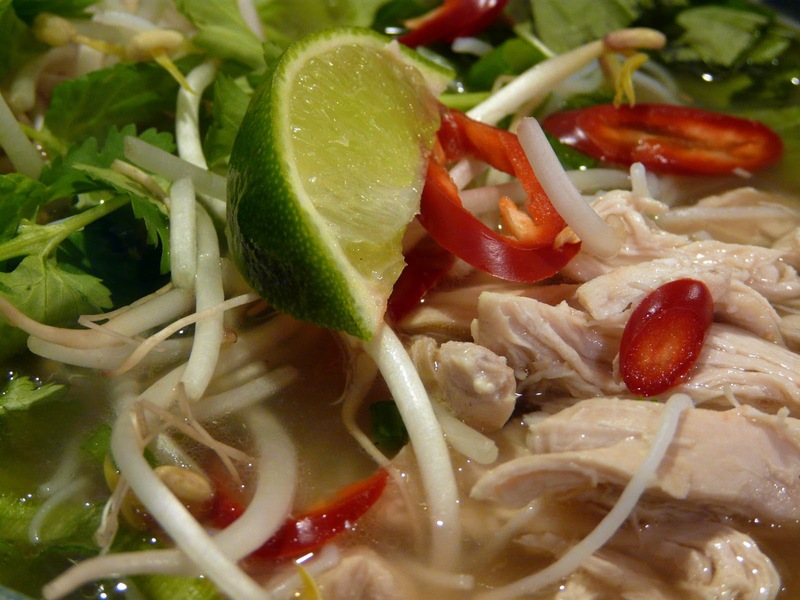 The chicken was set aside and the broth strained. While the broth was cooking I prepped the rice noodles and the garnishes for the soup - chopped green onion, cilantro, and lime. On my way to work I picked up the ingredients I as missing - bean sprouts, basil and a red chili pepper. 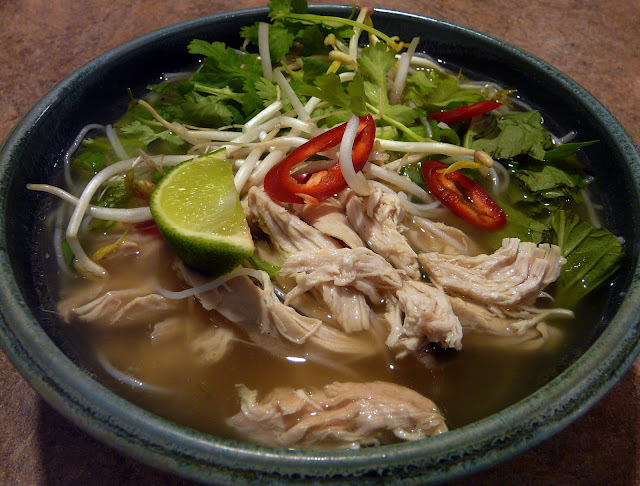 The broth went into a container and the noodles, shredded chicken and other garnishes went into a separate container. I even remembered to bring a bowl, chop sticks and a sharp knife to slice the chili pepper. And my camera so I would have photos to go with this post. I made a few adjustments to the original recipe, (I know that doesn't surprise anyone though does it?) leaving out a few ingredients that I'm not keen on and adding one or two others. You can find the original recipe on Jungle Frog Cooking. Simmer broth until chicken breasts are cooked. Remove, cool and shred chicken. Strain broth. Stir in a little Hoisin Sauce. 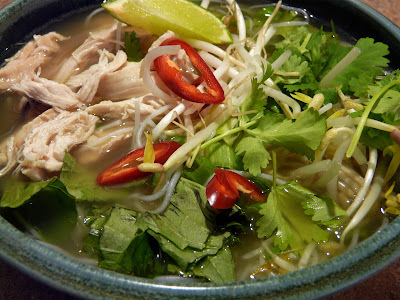 To serve, heat broth to boiling and add noodles. Add chicken, . Serve with garnishes on the side. Each person can add garnishes to suit own taste. To participate in Weekend Blog Showcase, pick a recipe from a blog other than your own, make the recipe and post about it on your own blog, crediting the originating blog with the recipe. Then sign into Mr. Linky. That's all there is to it! Lori and I look forward to your participation! I had the good fortune to make Pho with a Vietnamese co-worker this week. I was amazed at how simple it really is to make. The only question is if I can duplicate it at home. Yours looks wonderful, I really must make it for my family soon. Oh, Ann, that Pho looks perfect for this cold snowy day...so beautiful!!! My entry for this Weekend Blog Showcase is from Simply Scratch. The Honey Roasted Cashews are perfect for holiday hostess gifts...as long as you don't eat them all yourself!!! Looking forward to seeing all the entries this weekend. Super recipe for Pho. Even Florida is having a cold snap...would be perfect for dinner tonight!